Category Children’s 6-9 years. 40 illustrations. The dastardly members of the International Chess Academy are after the secrets that underlie Ralph’s game. 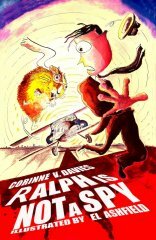 Join Ralph as he enters a world of espionage . . . invisible ink . . . kidnap . . . code-breaking gerbils . . .rain macs . . . hairspray . .and (of course) cheese sandwiches, as he is forced to question who is the REAL spy? Corinne V.Davies began entering poetry and writing competitions at the age of 5. Known also as a playwright, she has concentrated on writing rhombic tales for children since 2009 - teaming up with illustrator, El Ashfield, to create her much loved character 'Ralph'. Currently she is still touring schools with her books and festivals with her Ralph trilogy. Davies was a finalist of The People’s Book Prize 2010/2011 with her book Ralph is (not) a Vampire. A fantastic book ! My daughter loves it. Well written and hilarious - my son loved it. Excellent! Have bought the whole Ralph 'trilogy' for my nephew who loves it. Such a fantastic book. Can't wait for more from such a fantastic author. Amazing book - so funny, and the illustrations are awesome! My favourite book for kids 2011 and I've read a few!